Brews directly into 1.9 to 3 litre airpots. Airpots are easily transported to remote meeting rooms, breakfast bars, etc. Keeps coffee hot and fresh for hours. Pourover feature included on automatic model also. 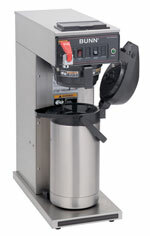 Brews 3.9-6.8 gallons/hour (100-175 cups) 23.6"H x 9"W x 18.5"D. 120V. NSF listed. Airpots sold separately.